Find Little Problems Before They Become Big Ones. The industrial meter for demanding users. NEW – Large 50,000 count, ¼ VGA display with white backlight. Multiple sets of measurement information can simultaneously displayed at the same time. NEW - Logging function with TrendCapture is an essential tool for documenting the performance of your designs, processes or systems, monitoring unattended while you work on other projects. It plots measurements as a single line to help detect signal anomalies over time, storing up to 10,000 readings. Using on-board TrendCapture, you can graphically view logged readings without a PC. (Software and interface cable optional). NEW – Log multiple sessions or log data continuously for over 200 hours. This is useful for characterizing the performance of a design or for unattended monitoring. NEW - i-info button on board help screens for measurement functions. Unsure about a function? Go to that function and Press the “i” button. NEW – LoZ Volts. 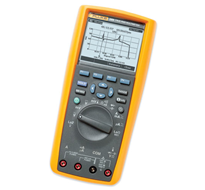 Low impedance voltage function prevents false readings due to “ghost voltage.” It is also the recommended mode when testing for absence or presence of live power. New – Low Pass Filter for accurate voltage and frequency measurements on adjustable speed motor drives and other electrically noisy equipment. 50 ohm range – useful for measuring and comparing differences in motor winding resistance, low ohm measurements, or other contact resistance. Two terminal 50 ohm range with 1 milliohm resolution, 10 mA source current. NEW – Saved measurements allow you to name and recall measurements made in the field. Real Time Clock – for automatic time stamping of saved readings. NEW - Field upgradeable and expandable meter lets you stsay current as new capabilities are added. NEW - Multi-lingual interface. Min/Max/Average with Time Stamp to record signal fluctuations.